You're either a berry pancake person or a chocolate chip pancake person. Although we respect the chocolate chip game, we love berry pancakes. The hubby prefers the chocolate type, so we have to alternate! If you're on team berry, you will love these raspberry pancakes! 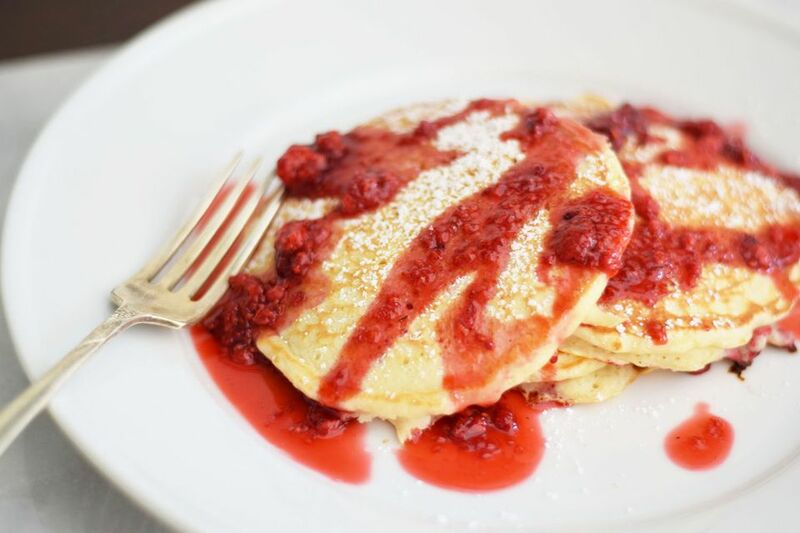 Berry pancakes are even more delicious when you drizzle them in berry sauce. We love raspberries best, and it's nice to try a different berry other than blueberries in pancakes! These pancakes are super easy to whip together. We always use my basic pancake recipe as a base! The raspberry sauce is really easy to make. It's just raspberries and sugar! You can also replace the raspberries with strawberries or blueberries, whatever you have on hand. You can use fresh or frozen raspberries. We like to keep frozen berries in the freezer for Saturday morning pancakes! This makes a smaller batch of pancakes (about 8, depending on the size), so it's great if you have a small family. But you can easily double or triple it when you have a larger family or more guests. You can also make a larger batch and freeze the extras after they have cooled. They reheat well in a toaster or toaster oven! Beat together the egg, milk, and melted butter. Whisk in the vanilla at this time too. While the batter is sitting, heat 1 cup of the raspberries with a 1/4 cup of sugar in a small saucepan. Cook on medium-low heat for about 5 minutes, until it is slightly thickened but still saucy. Grease the griddle. Spoon the batter in about a 1/4 cup portions on the griddle add a few raspberries, let it cook for a few minutes and then flip—Cook for a few more minutes on the other side. Drizzle the pancakes with the raspberry sauce and sprinkle with powdered sugar.